If you've never been to NECSS, let me just start by saying that it is a wonderful opportunity to connect with others who are interested in science (though by no means is everyone that goes a scientist - yours truly, for example) and how to apply critical thinking to things we encounter in our day to day lives from the exotic (psychics, ghosts, etc.) to the humdrum of daily existence (news reports, religion and society, grief and loss). You can meet new people (I got to meet several of the speakers, as well as other attendees), put faces to virtual friends (hi, @UAJamie!) and say hello again to those you haven't seen in a while (like the people you met the year before). Like last year, the weekend was a lot of fun. Great speakers and plenty of social opportunities abounded. I only had two real complaints. First was that the evening before the conference, they scheduled a Story Collider show at the same time as the NYC Skeptics' Drinking Skeptically preregistration event, making for a sparse showing at the latter. Second was the venue, Florence Gould Hall. It was smaller and darker than last year's conference hall, but the addition of a separate vendor room (rather than set up in the lobby) was nice. All of the ex-conference events and lodgings were also quite a walk (e.g., about 2 miles to Drinking Skeptically). Another change to the program this year was that rather than a day and a half of presentations, there were two full days, as well as some additional smaller events to attend. The full schedule can be found here. John Bohannon is a journalist for Science Magazine. Being the first speaker can be a difficult position; your talk can set the tone for the rest of the day, not to mention whether your audience will be awake and alert after traveling and/or drinking the night before. You need a hook, something to grab your audience's attention. Bohannon brought just that, combining two talks into one. The first topic looked at how hard it is for the average person to get a good, accurate picture of the casualties in a war. Reporting almost invariably skews the numbers much higher or much lower than the reality. Subtle changes in how one goes about collecting the information, the choice of models used and how the data is analyzed can have a huge impact on the accuracy of the final numbers. In an effort to get a more accurate picture of the casualties in Afghanistan, Bohannon donned the hat of "war correspondent" and accompanied the U.S. military around the country. Bit by bit, he teased out data on the civilian casualties in Afghanistan as a result of the war, but even then, the numbers only represent an estimate. As I write this, he is on his way over to Afghanistan for a follow-up visit, hoping to gain an even better insight. The video clips provided much-needed levity to counter the somber, heavy topic of wartime deaths. Bohannon tried to keep the two disparate topics connected by commenting how one would think that conveying research through dance would be more difficult than accurately reporting death statistics from war. Unfortunately, the connection was tenuous, at best, and resulted in a somewhat disjointed presentation. Both topics were very interesting and could have stood on their own. The constant shifts between topics was more amusing than annoying, though, aided by the novelty and humor of the dance videos. A decent, though not stellar, start to the day. Up next was self-described "baby skeptic" Deborah Feldman, author of Unorthodox: The Scandalous Rejection of My Hasidic Roots. Feldman was raised in a Hasidic Jewish community in Williamsburg in Brooklyn, NY, part of the Satmar community. She recounted her upbringing and how she was not allowed to read books in English, nor go online. Women in her community were not allowed to read the Talmud because they would "ask too many questions" and get "confused". The atmosphere was oppressive, and the prohibitions only served to entice her to sneak out to the local library to read English translations of books, including the Talmud. Before she realized, she had stumbled onto some skeptical books that fueled her questions. At 17, her parents arranged her marriage, and, being a rebel, they figured a very strongly religious husband would be best. She married and eventually had a son, but how, she says, could she be responsible for bringing another human being into this culture. And so she sought a way out. Telling her husband that she "needed some space" but assuring him that it was only temporary, she moved out. She applied to Sara Lawrence College and, on the strength of her essays, was accepted. Eventually she and her husband divorced and, a first for the Satmar, she was able to keep her child, rather than let him be taken back to the Hasidic community she left. Her book is a memoir of her experiences and how she was able to claim a life for herself outside the oppression of the male-dominated society, but it also earned her quite a number of enemies who have tried to portray her as a liar. Her story was very compelling, and contained a lot of similarities to another individual, Joshie Berger, who managed to leave the Hasidic community in which he was raised. I saw his talk last year in Boston (video might not be safe for work due to some language). One aspect that surprised me in Feldman's talk was that there is a Hasidic court whose decisions (based on religious texts, much like sharia law) are binding and recognized as such by the U.S. judicial system. Once a case is started in one of these courts, it is next to impossible to move the case to a civil court. Some might argue that for cases where there is no strong law or precedence in civil courts (e.g., small claims, etc.) that such a system is fine, but it is an inherently unfair and biased legal system, particularly where women are concerned. At any rate, Feldman's talk was very informative and eye-opening. The highlight of the morning for me was the live recording of The Skeptics' Guide to the Universe. I'm a big fan of this podcast and strongly encourage you to stop reading and go listen to a few episodes right now if you've never heard it before. It is not only informative, but highly entertaining. At any rate, NECSS marked the 7th anniversary of SGU. James Randi was a special guest on the show, which is up and available for your enjoyment. One of the more amusing moments was right at the beginning during introductions, when Evan Bernstein came on stage wearing a NY Jets jersey with number 15 on it. He knelt and bowed his head, then pointed upward. Except, when he turned around, instead of Tebow, his jersey read "Skeptic". I won't give any spoilers about the show, but I will just mention that we discovered that Bob is a pedant. Seth Shostak - Aliens – Are they here? Are they there? Seth Shostak is the Senior Astronomer of the SETI Institute in Mountain View, CA. His talk followed lunch. Unfortunately, I missed it, as I got side-tracked talking to Deborah Feldman and a few others. The conversation moved on to rock climbing and dislocated tendons (always a blast!) and before I knew it, Shostak's talk was over and the next one was starting. I really am bummed that I lost track of time and missed it. But I'm sure it was stellar (haha)! The first Mexican woman to ever graduate with a PhD in physics from Stanford University, Debbie Berebichez, also known as The Science Babe, discussed physics as applied to the world around us. She began by discussing wave movements, whether through a liquid, air or as light. For liquid waves, she engaged in some audience participation using the time honored sports arena movement known as The Wave, illustrating how when we see waves rippling across water, the effect is created by individual molecules moving up and down, rather than along the plane of the water. 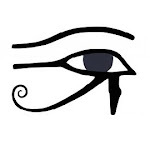 Berebichez also discussed how, if light (which at times behaves as a wave) enters our eyes causing signals to go to our brains to create pictures of the world around us, why not use sound in the same way? This is something that bats and dolphins do every day in a process called echolocation, but humans generally aren't all that good at it. Unless, of course, you happen to have been blind and developed the skill from a very young age, like Daniel Kish. She played a video of Kish riding a bike and avoiding obstacles in his path by making clicking sounds. It is very impressive to see someone who, without a sense most people take for granted, is able to "see" their environment nonetheless. Moderated by Meghan Groome, this panel discussion examined how people learn to think critically. 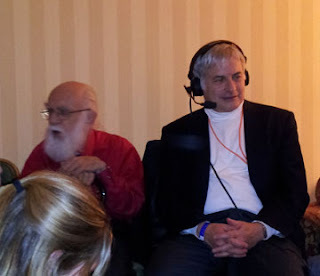 Groome was joined by DJ Grothe, President of the James Randi Educational Foundation (JREF) and host of the For Good Reason podcast, and Marc Barnhill, instructor at New York University and City University of New York where he teaches English and critical thinking. Christopher Emdin, professor of science education at Teachers College, Columbia University, was meant to be on the panel, as well, but was unable to make it due to traffic. Grothe talked about efforts of the JREF to assist teachers bringing critical thinking into the classroom. They have produced a number of educational materials for teachers to use, presenting students with questions like "Do you have ESP?" Rather than simply telling the students "Nope" and moving on, the modules examine the question and help students form hypotheses, test the hypotheses and come to conclusions based on evidence. While the JREF works primarily outside the classroom, however, Barnhill works on the inside. His critical thinking course is part of the required curriculum for students; he has the advantage of a captive audience. Everyone on the panel agreed that the best approach to teaching critical thinking is to have people actually do it, rather than starting with "X is wrong". And the emphasis isn't necessarily confined to some specific subject matter, but rather how to apply critical thinking skills to any subject. One question that was not fully discussed was how to engage the interest of those who view critical thinking as something that nerds and geeks do, something uncool. When I was in middle school, at the urging of one of my teachers, I participated in Odyssey of the Mind, a program that presents students with problems to solve. The only other people in my group were those with an interest in learning and a bit of a knack for engineering. No jock types or anyone that was not considered at least a little bit of a nerd. It's all well and good to help those interested in learning and figuring things out to hone their skills, but programs like that only target a small subset of the student population. So how do we get those who may not traditionally be interested in critical thinking to seek out and learn how to think critically? I got to see 12-year-old mathemagician Ethan Brown in January and was blown away. His performance at NECSS was no different. He is amazing to watch. He does some impressive mental mathematics called mathemagic. Much like watching a stage magician and being amazed, even knowing that behind the illusions are physical techniques and lots of practice, knowing that Brown uses mental tricks to simplify calculations and frequent practice doesn't take away from how easy he makes it look. After some squaring, cubing, square rooting and cube rooting of rather large numbers, all without a calculator or even writing the problems out longhand, Brown finished with a magic square, getting three squares, picked by audience members and filled in with their chosen numbers. Each row, column and diagonal added up to, appropriately enough for a skeptics' conference, 42. Oh, and the four corners, as well as many, many groupings of four squares, also added up to 42. And he did it in only a couple minutes. Brown received, quite deservedly, a standing ovation. Looking back, what would have made his performance even better would be to teach at least one or two tricks to the audience. James Randi - Surviving the Quacks! Veteran magician, author and fierce advocate of critical thinking, James Randi recounted his efforts to combat the quacks and charlatans who prey on the vulnerable. He recounted how he helped bring down Peter Popoff. The truly disturbing part of his talk was hearing how people who really, wholly believed that Popoff would use his claimed connection to God to heal their illnesses, not realizing that the faith healer was nothing more than a scam artist bilking the faithful out of their money. One particular family left a very strong impression with Randi, causing him to choke up even after all these years. The son was on crutches and his family had driven hours and hours to come to one of Popoff's tent shows. They had been to his performances before, but every time they were kept behind a roped off area and never allowed near the stage because the son's condition was beyond any faked healing that could wow the audience. But it isn't just faith healers like Popoff that Randi has taken on. He is currently working on a new book, A Magician in the Laboratory, recounting his work applying skepticism to science. Some rather prominent institutions, it seems, and how educated scientists are taken in by pseudoscience will be included. At the end of Day 1, there was a cocktail reception at which attendees could meet and talk to the presenters. Held at Connolly's, the atmosphere was pretty casual. I managed to talk a bit with Evan Bernstein, PZ Myers and Joe Nickell, as well as several of the attendees. It was a real pleasure to meet Nickell after having read many of his columns in Skeptical Inquirer. 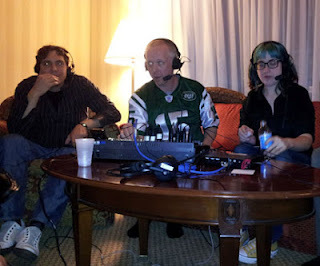 We talked a bit about popular shows about paranormal investigations and how it is very tempting to debunk, but Nickell emphasized that when approaching a paranormal investigation, one should examine and explain; any debunking would take care of itself. I asked him what was his favorite case, but he made me wait until the following day and his talk there. 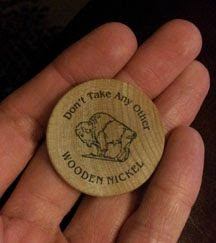 For my trouble, though, I did manage to walk away with one of his rather unique business cards. Gracious hosts, the cast of SGU had set out snacks a-plenty, though Jay complained about there not being enough eats, all the while grabbing handfuls for himself. (Sorry, Jay, but it's funny!) I won't talk about the show itself, so as to avoid spoilers. Suffice to say that it was a very different experience from the live show that morning, and certainly different from what you hear from a normal, edited show. For one, there's a lot more joking and ribbing of each other. And they talk a lot longer about each topic, which was kinda cool. The infamous PZ Myers of Pharyngula fame opened the second day of the conference. Admitting that the title was primarily a way to draw people in, Myers talked about "stuff" he likes about biology. A lot of his talk tried to cover "evo devo", or how biologists like Myers are trying to bring evolutionary biology and developmental biology together. He highlighted many of the problems inherent in marrying the two theories of the development of life, such as the differences in time frame, degree of change and so on. I have to admit that a decent chunk of his presentation was over my head. Whether that was simply the subject matter or lack of sleep, I can't really say, but I don't think the dim lights of the auditorium helped any. At any rate, Myers finished his talk with a picture of a couple cephalopods getting it on. As I mentioned before, Joe Nickell is an investigator of the paranormal, among other things. Nickell has a long history, including working as a private investigator. His list of skills he's acquired and applied to investigators over the years is impressive, to say the least. After the tease of the previous evening, I was really looking forward to his talk. Nickell took the opportunity to tell us about one of his favorite cases: The Case of the Two Will Wests (a full account is in his second book, Secrets of the Supernatural: Investigating the World's Occult Mysteries). The case takes place at the turn of the 20th century. A man named Will West is arrested and taken to the U.S. Penitentiary in Leavenworth, KS. According to accounts, the clerk asked if West had been in the prison before, to which he answered that he hadn't. Yet, after the clerk took his measurements for identification (a system known as Bertillonage) and compared them to the measurements for a previous inmate named William West, the measurements were within the margin of error. The photos of the two men were also nearly indistinguishable, yet at the time of Will West's incarceration, William West was already a current inmate of the penitentiary. Even the fingerprints, to an untrained eye, were exceedingly similar. The two men claimed no knowledge of each other, and apparently, many thought the two completely unrelated. Nickell's investigations found many connections, though, such as letters from each addressed to the same family members. Although accounts from the day cannot confirm it, it is likely that the two were twins and that they did know each other. How they came to use the same name and both be imprisoned in the same penitentiary, however, is left (at least for now) to speculation. The case was quite intriguing, though it's hard to imagine how anyone could think that the two men were unrelated. It serves as a great example of Occam's razor at work. As with the previous day and SGU, the New York City Skeptics' podcast, Rationally Speaking, was recorded live, hosted by Massimo Pigliucci and Julia Galef, with guest David Kyle Johnson. Where SGU takes a more science- and fact-based approach to topics, Rationally Speaking tends to be a bit more philosophical. The live show was no exception. The topics were the Simulation Argument and the Problem of Evil. Heady stuff for a Sunday morning. The Simulation Argument basically goes like this: it is far more likely than you might think that you are currently living in a computer simulation. The Problem of Evil may seem on the surface to be completely unrelated to this, but Johnson argues that, when religious tenets regarding evil are argued to their logical conclusions, adherents are left with one conclusion: they are currently living in a computer simulation. Although I started off feeling a bit hand-wavey about the subject, I was pretty quickly drawn into the discussion. The concepts are not particularly new to most people, I think (I came up with similar ideas about the nature of reality and our interactions in it around high school/college), but the way that they talked about it was thought-provoking. Unfortunately, there's no real way to prove the ideas true or false; we can only talk about whether or not it is likely and, if so, how likely. Even if philosophy isn't for you, I'd recommend giving the podcast a listen. Most NECSS attendees probably would have expected George Hrab to be performing some music. It's what he tends to do. For example, last year, he did a duet with Bad Astronomy's Phil Plait. But this time he changed it up a bit. He simply talked. And its a topic that doesn't really come up all that often among skeptics. Namely, how do those who don't believe in some higher power or afterlife deal with grief and loss? Hrab shared with us his experience of losing his dog, and the pain that came with the loss of a cherished member of his family. For him, that pain was necessary. Thinking of his dog in some doggy heaven provided no comfort. Instead, it raised too many other questions: was his dog waiting for him, wondering where he'd gone? Would his dog remember him when he eventually kicked the can? Would he be mad? In a similar vein, he shared how his mother worries about him and the rest of his family a lot; it's part of who she is. If heaven is free from woes, then would she stop worrying? And if she did, would she still be her? For Hrab, it was far easier to deal with grief and loss by accepting the pain as the price of love. Knowing that the memory lives on is what is important. When we look at our ancestors and civilizations that have died out, we marvel at what they left behind, rather than thinking of them as being in some afterlife. It was a very touching look into how one non-believer copes with loss, though Hrab did inject some levity so things wouldn't be too depressing (e.g., his Kirk impression). Hrab's non-musical talk was followed by a performance by mezzo-soprano Hai-Ting Chinn. Chinn and her accompanist Erika Switzer performed a couple of pieces based on science. The first consisted of quotes from numerous well-known skeptics and scientists, with cartooned images to accompany the words and musical themes matching the source, the content or both. She followed this up with "Libration", a song about the apparent wobbling of the moon as viewed in time-lapse photos. Like the first song, the lyrics were taken from or inspired by NASA documents and Phil Plait. Projected on the screen behind her was just such a time-lapse animation of Earth's moon progressing through its phases, showing a slightly different face all the time. The third and final piece, "A Fairy Tale Love Story" (music by Matt Schickele), was a duet with the aforementioned George Hrab. I'm sure there were some in the audience who were relieved that they'd get to hear Hrab sing at least once at this year's NECSS. Chinn and Hrab took on the personas of, shall we say, somewhat less than critical thinkers. Their woo-ing (ha!) of each other was frought with logical fallacies and plenty of puns. Although the first of the three pieces was a bit jarring for me (the sudden shifts in musical themes and melodies just wasn't quite my style), all three were beautifully performed, humorous and enlightening. Unfortunately, I had to leave NECSS early to catch a bus, thus missing the last two presentations. The second panel discussion of NECSS discussed, as the title of this section implies, Futurism. Since I missed it, I can't say a whole lot, other than that, from the tweets I saw, it got pretty heated, with a fair number of people strongly disagreeing with panelist J. Scott Armstrong. Again, not much to say about Brian Wecht's talk, since I was on a bus passing through Connecticut at the time (that is, if I'd actually made it out of New York by that point...there was a lot of traffic). Some of the tweets I saw really made me regret missing the finale of NECSS. One attendee that never really care much for particle physics tweeted that he was blown away. Overall, despite my gripes about the performance space and the location, the conference was well worth it. The opportunity to meet others and extend one's circle of friends and family alone justifies attending. Thanks to the NESS and NYCS for putting together a great weekend of science, critical thinking and socializing. I had a great time and feel I learned a thing or two from the speakers, not to mention meeting new people. Hope to see you all again next year! So glad you had a fun time. At least we can enjoy the podcasts. I went to TAM last year, but will have to miss it this year.